1 What is common daisy (Bellis perennis) ? 1.2 Habitat: where to find daisy flowers? 1.4 What is a flower head? 1.5 What does daisy mean? What is common daisy (Bellis perennis) ? English common name: daisy flower, common daisy, lawn daisy, English daisy, dog daisy, bairnwort, bruisewort or woundwort. The English name comes from “day’s eye” (eye of the day), in reference to its beauty, as daisy flowers open during the day, and close when the sun goes down. Note: Not to be confused with oxeye daisy (Leucanthemum vulgare). – Spanish: margarita común, margarita europea, margarita menor, margarita de los prados, maya, chiribita, pascuita, bellorita o vellorita, mancerina, coqueta. – Catalan: margalida, margalideta, margaridoia spring pasqüeta. – Euskera: ostaiska, ostaika, petxilote, pitxoleta, mitxoloti, mitxolote, basabitxilorea. – Portuguese and Galician: Bonina, Margarida, velorita, rapazinho, margarida vulgar, margarida minor margarida Common, margaridinha, margarida-rasteira. – Italian: Pratolina or margheritina comune. Etymology: Bellis derives from latin bellus that means “pretty” or ” beautiful flower”. 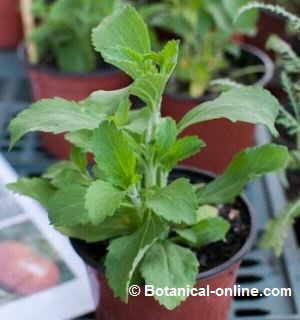 Perennis refers to perennial plant, because it does not lose its leaves in winter. Taxonomic Synonyms: Bellis hortensis; Bellis pumila; Aster bellis. 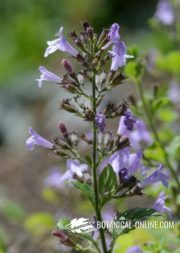 Origin: Native plant of central and northern Europe. Widespread in Asia Minor and naturalized in North America and New Zealand. Habitat: where to find daisy flowers? Daisy is a common perennial plant in the meadows of Europe, forests, streams and road margins. Especially found in pine forests. It resists frost. Distribution: nearly worldwide, cultivated as an ornamental or wild. Daisy (Bellis perennis) is a perennial plant, with herbaceous stems belonging to the plant family of Compositae. 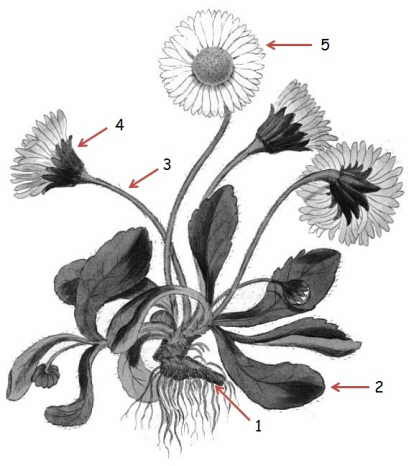 In the picture: botanical illustration of the plant parts of common daisy: (1) rhizome (2) basal leaves, (3) flower stalk; (4) bracts; (5) inflorescence of the plant, where have numerous tiny yellow flowers. The common daisy grows as a low rosette (basal leaves) about 15 – 20cm high. It has some rhizomatic roots, (1) cylindrical and creeping. Daisy leaves (2) are oval, spatulate and toothed, bright green, with short petiole. Each leaf has a size between 2 and 5cm. long. All the leaves are in a basal rosette. The inflorescence (5) of this plant is the typical one of composite plants, a floral head. This type of inflorescence is composed of tens or hundreds of tiny flowers. Daisy floral head is is between 16 to 25 mm. in diameter. Each floral head stands on a long peduncle or flower stalk, devoid of leaves from 13 to 20cm high, pubescent. Flowers are arranged in a flower head surrounded by bracts. The plant flowers appear in spring, in May (hence the name Maya), but remains in bloom until late summer. The daisy flowers have a radiated structure. In the middle of the flower head tubular hermaphrodite yellow flowers are arranged, surrounded by peripheral ray florets that are female. What is a flower head? A flower head, very representative in this family, is formed by many flowers gathered together resembling a single flower altogether. The central flowers are surrrounded by ray florets, that are a type of flowers in Compositae plants that resemble the petals of the whole inflorescence, and which are often referred to in the same way. In a whole, the whole flower head resembles a single flower. When we play “she loves me, she loves me not”, we are removing the ray florets or the female flowers of the periphery of the floral disc or floral head. 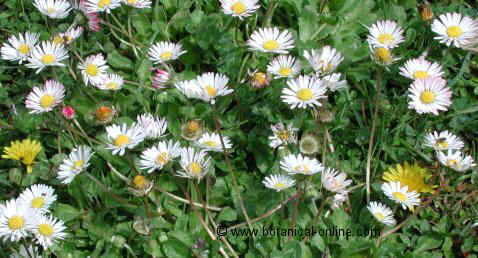 Ray florets of a daisy are white, slightly pink, being a very attractive and colorful flower among meadows and fields. It is a honey plant. Daisy flowers open during the day, and close when the sun goes down or there is bad weather. As a result, this plant is called daisy, which comes from “day’s eye” (eye of the day). Daisy flowers follow a heliotropism, that’s to say, its floral head aims to follow the sun. These flowers are pollinated by bees, bumblebees, beetles and hoverflies. * More information: video pollinating a flower. Actually, a daisy is not a flower but an inflorescence. It belongs to the Compositae family, and it is composed of many tiny flowers, yellow, arranged in a flower head or floral disc. In the picture: parts of the daisy flower. 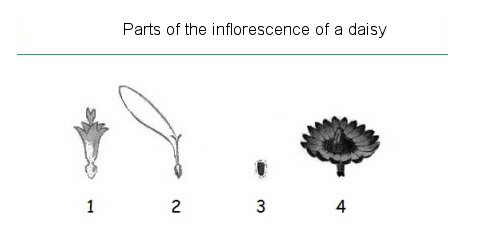 (1) One or tiny tubular flowers that make up the flower head center, with 5 slots, germ and stigma, (2) One of the female ray florets of the peripheral part of the disc, in the form of ‘spoke’, comprising germ, stigma and style; (3) seed, (4) Flower head or floral receptacle formed by bracts, where the flowers are arranged and subsequently the seeds. Daisy is considered a weed of lawns. Leaves: The leaves of the daisy plant, rosette-shaped, are edible and are used as food, raw or cooked. The young leaves are eaten in salads with Sorrel leaves and dandelion (this is a medieval delicacy). Especially in early spring, the new leaves are a food rich in vitamin C. You can add to the sandwich as if it were corn salads. The leaves can be cooked in soups, pies, tortillas, fillings, lasagna, etc.. The fresh leaves have a sweet and slightly sour and bitter taste, that, when cooked, becomes milder. With the infusion of the leaves we can prepare a mosquito repellent. Flowers: Flowers of Daisy are edible. Flower buds and petals are also consumed in salads. Green shoots can be pickled like capers. The flowers, before opening, can just be eaten in salads, providing a pleasant taste reminiscent of walnut. The medicinal properties of Daisy were already registered in Gerard’s Herbal, in 1596. In folk medicine, the flowers are macerated in water to prepare a cough remedy. 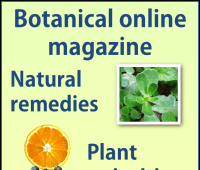 It removes mucus and rheumatism. Externally, daisy preparations help heal wounds, treats bruises and cardinals. 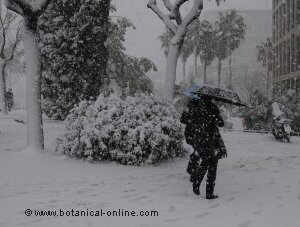 It is also used in homeopathic preparations. 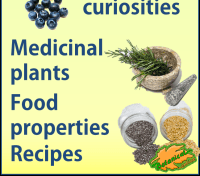 * Learn about its medicinal properties. Carbohydrates: glucose, rhamnose, arabinose, inulin. Vitamin C: daisy leaves have very high content in vitamin C, 100mg. of vitamin C per 100g. fresh leaves. This content is comparable to that of lemons, for example. Triterpenoid saponins (2.7%): triterpenoid esters 1 and 2. High content in roots. 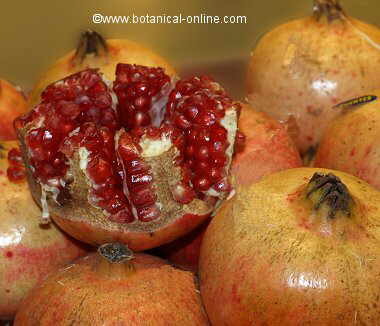 Flavonoids: apigenin glycosides, aglycones (apigenin, kaempferol, quercetin), flavonol glycosides. 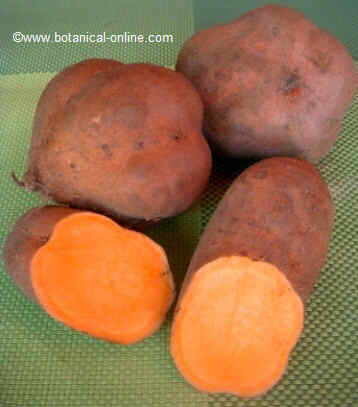 Oxalates: due to its content of oxalates, we recommend boiling the leaves before eating, and discard the cooking water. Oxalates are left in the cooking water. Annual daisy (Bellis annua): A daisy with an annual cycle. Common daisy (Bellis perennis): small perennial daisy that remains evergreen. Common in central and northern Europe. Widespread in Asia Minor and naturalized in North America and New Zealand. Southern daisy (Bellis sylvestris): Wild daisy, with larger leaves and bigger flowers than Bellis perennis and B. annua. Some authors believe that the gender of this species, Bellis, derives from latin bellum, that means war, in reference to its leaves that help heal wounds and bruises. This beautiful flower caused great anger among the German rulers in the eighteenth century. It was attributed with abortifacient properties, and that is why it was banned and exterminated nationwide. Currently, there is no evidence yet that this plant is actually abortifacient. In Roman mythology, the origin of common daisy was attributed to voluntary metamorphosis that Belides nymph underwent, to hide from Vertumnus, god of gardens and shepherds, who pursued her. Christians believe this flower originated from the tears of Mary Magdalene.